The last few weeks of September and the first few of October are significant times in Switzerland: it’s time for the désalpe, or the alpabzug. The cows, which have been feasting on the rich grasses and herbs of the mountains during the summer, are brought down to winter pastures back in the village. While some areas just do this yearly ritual without any hoop-la, others make a festive day of it – a chance to celebrate the farmers, the cows and their cheese. The little village of Les Charbonnières lies in the cheerily named Vallée de Joux, tucked in the edge of the Swiss Jura Mountains, just next to France. The landscape is softly rolling, with no drama, and a pretty lake. The village itself doesn’t consist of much except an old-fashioned inn-hotel, and a boulangerie, so the loop of the streets was over pretty quickly. Interestingly, and despite the fact that the village was celebrating the 22nd Fête du Vacherin Mont-d’Or, I found it difficult to find out really what was going to happen on the day. The crucial piece of information was that it started at 9am, and that the cows would start their descent then. So we got there for just after 9am. Already the village was bustling. The stalls were all just opening up and because there weren’t many people around we got to see the range of what was being sold: baked goods, crepes, wines, farm goods, cow bells… and cheese. Lots and lots of cheese. 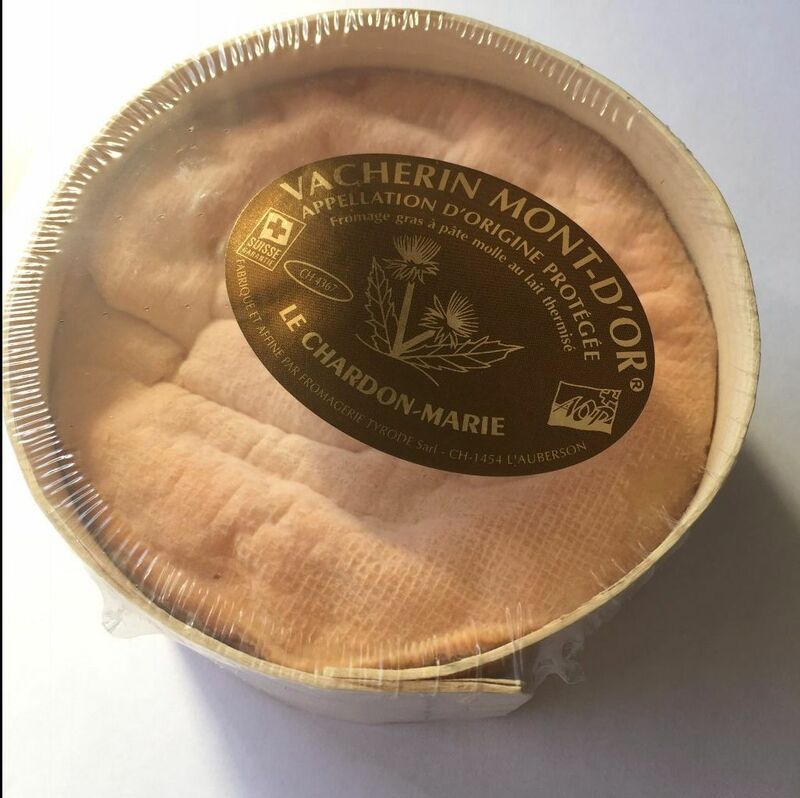 The cheese was mostly of the Vacherin Mont d’Or variety. The Vacherin, as it’s usually called locally, is a soft, seasonal cheese traditional to the Jura region. It has a very specific life cycle – it’s made between September and April and sold between September and May. This is because the farmers mainly produce large wheels of Gruyère (which you can also try and buy at the fair), but during the winter months they don’t have enough milk for that, so instead they started making, some 200 years ago, a soft cheese – the Vacherin. Unlike the unpasteurised French version, the Swiss thermalise the milk (it’s a lower level form of pasteurisation) before it’s bundled into an interesting round shape and placed in round spruce boxes. This an important part of the life of this cheese, because of the seepage of tannin flavour… yum. I’m no cheese expert, but I was taken by the Vacherin – from the ones I tried, the flavours varied from buttery to olive-y. I have never in my life spent 10CHF on a cheese, but I became slightly obsessed by one particular make, so I happily handed over my money and got an attractive boxed cheese in return. There was also a family which demonstrated whip-cracking – waving massive ropes in the air and causing extremely loud whooshing and snapping sounds to resonate through the air. This seems to be more of a central-Swiss tradition, but it was interesting to hear just how powerful sounds can be. Presumably a helpful trick when trying to get the attention of a herd of cud-chewing cows. A Geneva based group showed off the skills of their dogs, Bouviers and St Bernards. We couldn’t see them doing… whatever it was they were doing, but we saw them when they came down the hill. Then finally – there was a tinkling sound in the air. The bells of the cows could be heard behind us, and then down they came. They seemed to arrive every half hour or so, which made for some tiresome waiting around, and they seemed to really charge down the road, so it was all over pretty quickly. Just as we thought that the cows were going to be taken to some unseen place yonder, we heard some bells behind us. Looking down, we saw that this last batch of cows was being driven around the house that was below the road we were standing on and to the patch of grass behind it. The cows had come home. Admittedly I was a little disappointed by the festivities at Les Charbonnières. I was comparing it to the only other désalpe I’ve seen, at Albeuve last year, where there were more stalls, and there was more to do while waiting for the next batch of cows. And the landscape was much more majestic and striking. Having said that, I enjoyed visiting this part of the Jura, and trying the cheeses was fun as well as educational – although quite difficult due to the crowds that built up by about 10.30 in the morning. However, the experience of seeing the cows all decked up and hearing the insanely loud bells was the main reason for the visit, and that was charming. Events were continuing all day, but because of the crowds, and the fact that we didn’t really know what was going on, we left just before midday. However, I gather there was some big tasting event in the afternoon.